The problems of 2D and 3D image restoration from uncertain and incomplete 1D and 2D data respectively are considered in Bayesian framework. The reconstruction concepts, algorithms and software are developed and evaluated using simulated and experimental data with phantoms and real pipes[The experimental data were provided in BAM, LETI (France) and BASF (Germany) with a series of real tubelike phantoms having both as manufactured and damaged inner surface. Both x-ray tubes and Gamma-ray sources were used in the experiments.]. Both voxel and surface representation of pipes images are used and discussed. The restored pipes images are exploited for wall thickness assessment with an error less than ą0.5 mm using appropriate image viewer. presence of a process liquid. The principle obstacles, causing measured data corruption, arose actually from the inadequate description of the x- ray propagation by the absorption law. Other factors like spatial gradient of the optical length of x-ray in metal along the detector line (compare Figure 1), strong scattering contribution, and finally X-ray image blurring, which is additionally influenced by concomitant effects like edge effect, geometrical unsharpness, etc., contribute to the x-ray image. Mathematically that causes an induced uncertainty in the original image under restoration given particular data. This situation requires application of some non trivial approach to the reconstruction procedure like, e.g., recently developed Multi Step Image Restoration Technique using Bayesian image reconstruction at the final step [1-4]. The present article exhibits the developed technique being evaluated using simulated and experimental data. In all cases at the end from only two to five projections, exposed within an observation angle 60° - 90°, were made for data acquisition. 2D and 3D cases for image reconstruction were considered. Both regular x-ray films and imaging plates combined with corresponding digitization procedures were explored in the experiments. All computations are supported by PC platforms. Finally the images of restored pipes were compared with the originally exposed to estimate the reconstruction errors. The Bayesian image restoration technique with prior knowledge is applied to the inversion of projected data, the corresponding procedure being described below. Two approaches are applied to the sampling of the object space. In the first one, dealing with the 2D cross section, the object space is discretized on the uniform grid in polar coordinates yielding quasi-rectangular cells in this coordinate system (voxel model). In the second one the object is separated in space only by its surface coordinates in the Cartesian or polar coordinate systems. where ln,ij is the path length of the ray in the cell j, which is projected onto pixel i in projection n.
with xn,i giving the x-coordinate of pixel i in projection n, xc being the x-coordinate of theprojection of the pipe center on the detector plane, and a, b, c representing unknown parameters, which have to be determined by means of available optimization procedure. The third summand in Equation (5) is introduced to compensate the observed asymmetry of the X-ray image. While calculating the ray sums pmn,i, the attenuation coefficient m is calculated rigorously taking into account the phenomenon of beam hardening. The parameters a, b, and c are calculated from the mean square optimization of the experimental data Dn,i, provided by exposing the corresponding perfect pipe: the discrepancy between the measured D and the one obtained from Equation (5) is minimized. where g - unknown constant, calculated using data from the perfect pipe. The next paragraphs illustrate the application of the technique for 2D and 3D pipes image reconstruction from limited data, and consequent pipes wall thickness assessment. additionally the influence of scattered radiation is not negligibly small. S4 - are successive positions of the x-ray source. Fig 1: Geometrical setup for data acquisition. 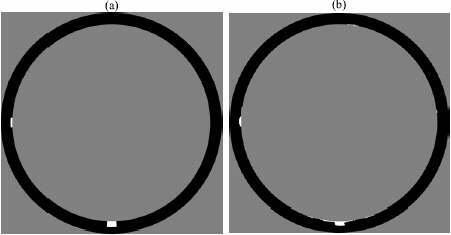 Fig 2: Exploited 2D cross section extracted from projection (a) together with optimized data set region (b) for reconstruction purposes. In our experiments the exposed pipe had a radius of 57 mm and a nominal wall thickness of 6 mm. The machined notches 1 and 2 had the width of 6 mm and a depth of 3 mm and 1 mm, respectively. For the exposure a 0.8 mm focal spot X-ray tube with a voltage of 200 kV and a current of 2 mA was used for the 5 projections within the observation angle between extreme sources positions of 90°. The exploited 2D cross section, extracted from the image, is shown in Figure 2a. Large difference of track lengths in the metal (the longest path length belongs to the ray tangential to inner pipe surface and is close to 51 mm, the smallest is close to zero near the outer tangent and 9mm in the center), and small tube voltage used for the exposure resulted in image blurring effect in the pipe region bounded by the outer and inner tangents. One of the key point of the proposed technique is the procedure of excluding from the iteration step of those experimental data, which are located in the area of large blurring effect. In our example only the data set similar to that shown in Figure 2b were used for the reconstruction. The optimal cut-off was estimated by minimizing the reconstruction error at the level of about 20 % of the total pipe projection. It reduces the amount of input data and essentially improves the quality of restoration. The result of image restoration is shown in the Figure 3b which can be compared with the actual pipe image given in Figure 3a. The marginal reconstruction error was less than 0.16 mm. Fig 3: Comparison of reconstruction result (b) with original image (a). where superscripts mean calculated and measured values respectively. Using calculated values of d, e and f for investigation of inspected pipes. Figure 4 illustrates all five profiles which are logically follow the procedure described above. The final profile used for reconstruction is shown by curve 5. Fig 4: Original x-ray profiles for the pipe (100 mm diameter) defected by notch (1), simulated absorbed radiation (2), extracted scattered radiation and background (3), simulated scattered radiation and background (4), profile used for restoration (5). The development profile of the reconstructed pipes inner surface is shown in Figure 5. Fig 5: The development profile of the reconstructed pipes inner surface. The reconstruction was done after extraction of the scattered and background radiation. The mean square error of reconstruction is 291mk. Su : u =1,L, U, S =YSu, Su1 I Su2 = 0, u1šu2 given by triangle with vertexes, defining the nodes of a discrete grid. The partition of the surface is implemented in such a way, that the osculating sides of adjacent triangles and their common vertexes belong only to one of them. search for the cross points of the rays, passing through the inner and boundary pixels of the triangle s nu , with the inner and outer object surface. Mi, i = 1,L, l and the inner surface, being the best fit to measured data. The reconstruction results are shown in Figure 6. Fig 6: Reconstruction results: (a) gray value representation of inner pipe surface together with circumferencial wall thickness profile 1 and profile 2 along pipe axis. Investigating the results, shown in the wall thickness profiles 1 and 2, it turns out that the average pipe wall thickness is accurately restored with an error, which does not exceed 200mm. This value holds for smooth wall thickness variations as known from corrosion and erosion. The accuracy of the reconstruction of the notches is smaller and the error is estimated at the level of about 500mm. It is clear that the proposed algorithm can not restore through-wall holes (see Figure 6b) due to the applied surface representation in the reconstruction algorithm. Finally it turns out that the discussed reconstruction algorithm is capable to monitor wall thickness variations in pipes with an accuracy sufficient to meet practical requirements. This technique overcomes the major restrictions of other radiographic methods which usually allow measurements only at specific positions. V. Vengrinovich,Y. Denkevich and G.-R. Tillack,Reconstruction of Three-Dimensional Binary Structures from an Extremely Limited Number of Cone-Beam x-ray Projections Choise of Prior. Journal of Phys., D:Applied Physics. V.32, 1999, pp. 2505-2514. V. Vengrinovich, Yu. Denkevich, G.-R. Tillack, U.Ewert and B.Redmer, Bayesian Restoration of Crack Images in Welds from Incomplete Noisy Data. Review of Progress in QNDE, ed. by D. O. Tompson and D. E. Chimenti, v. 19A, American Institute of Physics, Melville-N.Y., 2000, pp.635-642. V. Vengrinovich, Yu. Denkevich, and G.-R. Tillack, Bayesian 3D x-ray reconstruction from incomplete noisy data. In book: Maximum Entropy and Bayesian Methods, ed. by W.von der Linden et. al., Kluwer Academic Publishers, 1999, pp. 73-83. Zolotarev S.A., Vengrinovich V.L. and G.-R.Tillack. 3D Reconstruction of Flaw Images with Inter -Iterational Suppression of Shadow Artefacts. Rev. Prog. In QNDE, Vol 16, ed. By D.O. Thompson and D.E. Chimenti, Plenum Press New-York, 1997. V.M. Artemjev, A.O.Naumov, G.-R.Tillack and C.Bellon, Simulation of Scattering Process in Radiation Techniques exploiting the Theory of Markovian Processes, Rev. Prog. In QNDE, Vol 16, ed. By D.O. Thompson and D.E. Chimenti, Plenum Press New- York, 1997, pp.309-316.